Summer and spring are undoubtedly the most popular seasons for traveling in the comfort of your RV. However, if you really want to maximize your level of comfort, you’ll want to be able to sleep and hang out inside without feeling like you’re in a sauna. That’s where choosing and installing the best RV air conditioner for your needs comes in. On a budget, you could opt for a vent fan. But the best that those can do is get the interior temp of the van to match the outdoor temperature. Conversely an RV ac unit can combat outdoor heat significantly more. Selecting and purchasing the perfect ac unit can be a bit tedious – especially with so many variants out there. After speaking with experts in the field and reading consensus online, we’ve narrowed down the units that dominate the market. We know how much you want to get out there and adventure, so let’s get started! 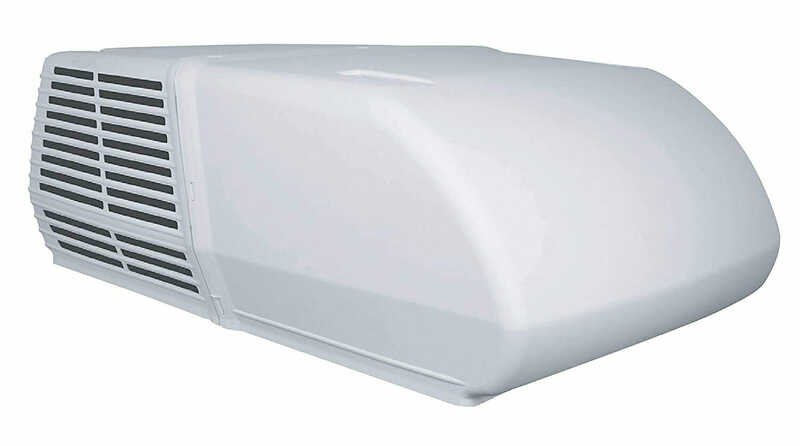 Ducted RV air conditioners: This type uses pipes (ducts) to keep cool air in circulation efficiently. You can choose where to run these ducts, such as under the flooring, through the walls, and in the ceiling. In most cases the ducts are already built into an RV. Non-Ducted AC Units: As you probably guessed by the name, these do not have ducts. Rather, they’re centralized units which circulate cool air with a simple blower. The internals of both units are usually identical. Under Bench AC: These are made to fit under a bench or in the compartment of your choosing. These are great if your RV lacks a lot of head space or height. The biggest downside to these is that you’re compromising on storage space. Rooftop AC: These are either ducted or non-ducted air conditioners. They’re great if you need to make the most of storage space, but can also increase the height of your vehicle. That makes parking options more limited. Portable AC units: These are useful if you’d like localized cooling, such as outdoors. They don’t work well in enclosed spaces because Newton’s law means that they expel more hot air than cold air. With a rooftop AC unit, sometimes you need to be wary of the height of your vehicle. There are low profile designs that reduce this factor, and tend to be more aerodynamic. Low profile designs are less conspicuous, but also tend to be slightly less efficient. This is mainly because they have less surface area to expel heat from. Some of the low profile designs have horizontal compressors which is a slight hit on efficiency as well. If you’ve already started looking, you can see that each unit comes with a BTU rating. BTUs, or British Thermal Units, measures the heat transfer capacity of the air conditioner. They’re defined by the amount of heat needed to raise the temperature of one pound of water, by one degree, Fahrenheit. The higher the number, the faster the ac unit can cool down a space. This is often one of the main factors in choosing an AC. Its determined by the outdoor temps, the interior space, and how well insulated your RV is. The standard unit size for RVs is anywhere from 13,500 to 15,000 BTU. Larger RVs will use multiple units to condition different areas. This may or may not be a big factor for you. Perhaps you’re planning on having a professional install it for you, or you feel confident in your own abilities. However, know that proper installation is an absolute must. For safety, convenience, and efficiency. We highly recommend reading the user manual with installation instructions before purchasing the unit to see if you’re up to the task. Just how extreme are you taking things? If you’re just going across the deserts of Arizona or Nevada, this isn’t going to be a big deal. It’s dry and hot, which is a climate most dedicate units can handle fine. If you plan on going in the more severe temperatures or high levels of humidity, you’ll need to get an AC unit that is accommodating to these conditions. Make sure the unit can start well and be reliable in humid conditions. It’s also important to note that many AC units are heaters as well. And these heaters are more sensitive to cold conditions. So if you’re planning on extreme cold, then the ability to heat is important in your decision making. This one is a little harder to rate for because people’s preferences are subjective. A unit too noisy for some is just fine for others. And the level of sound deadening that your RV has will play a factor in how much this affects you. As with any decision, budget will be a major factor in the unit that you go with. Take into consideration how large your RV is, the kind of convenience you want in terms of temperature control, and the conditions you’ll be using it in. If you’re using the AC unit in “normal” weather, you won’t need to spend as much – especially if you have a smaller unit. If you need it for more severe conditions, you’ll be paying more. On the other hand, a higher price doesn’t necessarily indicate quality. Think about the features you absolutely need, which ones you want, and which you could do without. 74 lbs 90 lbs. 99 lbs. 104 lbs. 29.2" x 27.2" x 12.7" 42" x 28" x 16" 29" x 40" x 9.5" 40" x 28" x 15"
Our favorite RV air conditioner is the Dometic Brisk II. The 13,500 BTU version of the AC unit is great for most RVs out there, and despite the somewhat-low BTU rating, it’s surprisingly powerful. Dometic is a brand which is highly reputable. So much so that they’ve been helping out NASA fulfill their air conditioning needs for almost a decade! The modern design of the Brisk II looks gorgeous, and comes in either black or white. The base pan is sturdy, and features an improved rigid shroud. The compact product is easy to install, coming with a gasket to fit to the roof with relative ease. With just about anything to do with travel, durability is a must. The Brisk II is made to last, ensuring this by use of aircraft-grade parts and polypropylene which keeps it sturdy yet lightweight. Compared to other models in its class, it’s 19% lighter, with 15% more cooling and better air flow. Configured for both ducted and non-ducted installation, it comes with a 3-speed blower and multi-directional air slots (also coming with a washable HEPA-style filter) for consistently fresh air. Operation is quiet enough that even while trying to sleep, it won’t bother you. This is thanks to the vibration-minimizing technology. The Brisk II is compatible with universal air distribution boxes (ADBs), as well as single-zone LCD thermostats, comfort control thermostats, and return air grills. The unit comes with a digital thermostat and remote control, thankfully, so you don’t really need to purchase any add-ons for supreme air delivery. Finally, we were quite pleased with the included two-year warranty, which is more than sufficient for this kind of product. Considered one of the most powerful RV air conditioners on the market today, the Coleman Mach 15 is not one to skip. Coleman has long been a trusted brand, consistently creating reliable, well-made products. The whopping 1/3-hp fan motor can produce cool air at up to 325 cubic feet per minute, which in layman’s terms, is pretty dang fast. Despite its power, the ac unit remains quiet when in use. So quiet, that you may even forget it’s there, except for the fact that you’re going to constantly be cool and comfy. At 15,000 BTU its perfect when you’re in even the hottest of climates, and keeps you warm with its electric heating element when temperatures drop. Never again will you have to worry about being uncomfortable in your RV. In contrast, due to the higher price, it may not be worth it for many consumers. If you’re planning on traveling in extreme temperatures/climates, the Mach 15 is definitely the way to go. It does feature a sealed shaft to protect against damage from the elements, and is easy to start under high temps and humidity. Due to its streamlined low profile, you have a very minimal amount of drag, making the most of your gas and money. With all-copper tubing and gas-flux brazed joints, you can rest assured that this AC unit will last you for many adventures to come. Installation isn’t the easiest, but it’s not overwhelming. You can get the job done with two people or more in around 3 hours, which is more than worth it! It is made to work with a ducted system, however, if you want to make it work with a ductless, an adapter is available. It comes with a two-year warranty, just like the Dometic Brisk II. Yep, we’re back again with another product by Dometic; this time with their Penguin II. Dometic is simply an unstoppable company when it comes to engineering and producing consistently high-quality air conditioners. You can see right away that a big difference between the two AC units, is that the Penguin has a much lower profile. This helps reduce drag and lowers your roofline for less of a chance to snag on overhead obstacles. This is the only unit we felt actually improved the appearance of whichever RV it was hooked up to. The base pan is rib-enforced, making it durable, yet ensuring the unit stays lightweight. Despite being so compact, it’s still rated at 13,500 BTUs. Operation is on the louder side on this list, but it’s considered acceptable by most people, and better than old units. Due to the size, weight, and compatibility with most RVs, installation is easy on this one as well for ducted or non-ducted setups. It also comes with a 2-year warranty, which is adequate. Ultimately, if you’re looking for a convenient unit that’s visually stunning, and makes your gas go farther – check the Penguin out. The Atwood Air Command is quite the unique AC unit, as well as one of the most efficient. Putting out 15,000 BTUs, the efficient dual motor design cools faster (at a claimed equivalent 1,800 BTUs) and could turn your RV into an ice box if you’re not careful! It comes with separate motors for the blower fan and condenser fan, which we felt was quite thoughtful. Not only that, but if you’re in humid environments, it dehumidifies the air really well. Did we mention it also comes with a heat pump, which is perfect for chilly nights or extreme weather? As far as looks go, we wouldn’t go as so far as to say it’s attractive or even stylish. The included fold-down temperature indicator adds to the interior design, making it look a bit more modern. In addition, it’s backlit, making it easy to operate in any lighting conditions. It also comes with a remote control which is perfect for those times in the middle of the night when you’re hot and don’t want to leave your bed. While it’s not the most lightweight we’d seen, it’s definitely lighter than the majority of older units. Operation is significantly quieter than the other models. In fact, some people have had to put on a white noise machine to actually fall asleep at night due to the lack of noise it produced. Installation isn’t too difficult, thanks to the size and weight of the unit. However, this will depend on how many people you have helping you out. The only real downside for us was that it tended to cycle every so-often, causing the RV to shake a bit during those times. Other than that, it’s a powerful, sturdy, convenient unit at an excellent price and perfect for more extreme temperatures. So, which one of the best RV air conditioners will you be taking along for the ride on your next adventures? Keep in mind that no matter which one you select, you’ll be receiving one of the top-quality products on the market, today. It all comes down to what you need for your situation, and what works for you. Thanks for tuning in, and happy travels!